I have to say I enjoyed watching the latest Boruto anime episode. ‘Jugo’s Reinforcements’ had Boruto, Salad, Mitsuki, and Sumire working together with Karin and Suigetsu to save everyone. 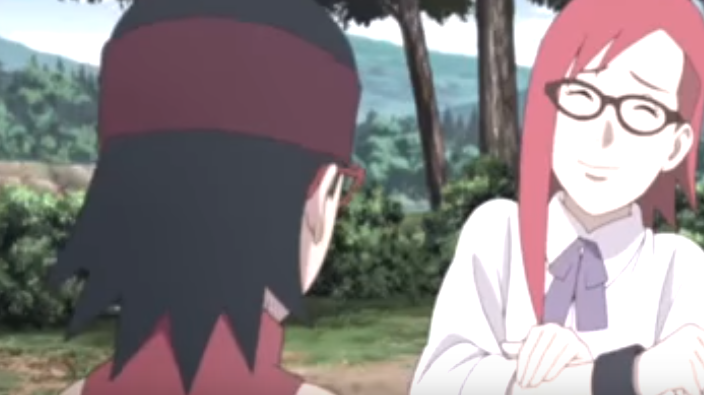 I appreciate familiar characters like Karin and Suigetsu playing a role in Boruto. It is nice to see them act as the good guys and help Boruto and his team whenever possible. Also, kudos to the writers for allowing Karin and Suigetsu to still retain their original personalities in ‘Jugo’s Reinforcements’. The episode opened with Boruto feeling disappointed because of his inability to complete the mission the infected village paid his team for. Deciding to search for Sumire, they run into Karin and Suigetsu. The two older ninjas wanted to break Jugo out and bring him back to Orochimaru. However, after learning what happened from Boruto and the rest, they realized it wouldn’t be easy as they initially thought. There were some interesting conversations and bonding moments in this episode. I greatly enjoyed seeing Karin and Salad catching up as much as they could. For Karin, Salad is like family. I’m a fan of how Salad has a resourceful female ninja looking out for her. Also, Salad being weirded out about Karin’s natural ability to heal people when they bite her was totally understandable. As for Boruto and Suigetsu, the two talked about Jugo being born with a Curse Mark and having to carry such a burden his entire life. I liked how Boruto brought up Sumire who also had a similar burden placed on her. The important thing to understand was how even if Boruto and Suigetsu wanted the best for characters like Jugo and Sumire, ultimately the person carrying the burden had to make the final decision about how to live their life. This episode featured smart enemies (which was a welcome change). They all saw through the plan and ruined everything for Boruto and his team. I can’t wait to see how the good guys figure out a way to defeat their foes. What did you think of ‘Jugo’s Reinforcements’? Let us know.